Software Used Images Plus 4.0 for camera control, calibration, stacking and Digital Development. Photoshop CS5 used for Flat Fielding , Curves, Color Correction, Saturation Adjustments, Noise Reduction, Star Shrinking, and High Pass Filter. HLVG for additional color correction, Carboni Actions for additional saturation adjustments. Notes This was a very difficult object to photograph and process. The original stack of images showed the galaxy, but it was only slightly brighter than the background sky. As such, I put a lot of effort into separating the galaxy from the background. 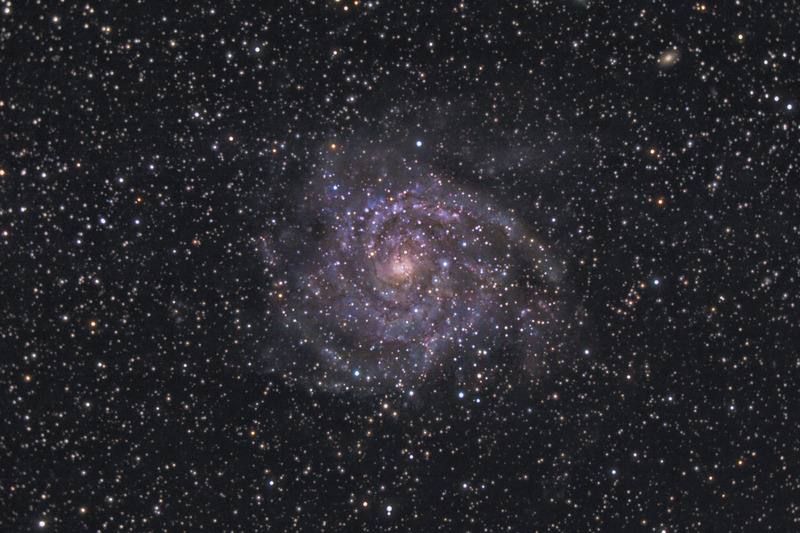 I'm very happy with the final result, although the image is a bit noisy due to the "stretching" to bring out the galaxy. This image won 1st place in Astrophotogallery.org's December 2011 "Hard-Galaxy" category. This image also won 1st place in Digital Astro's Challenge Photo - Galaxy category for December 2011.